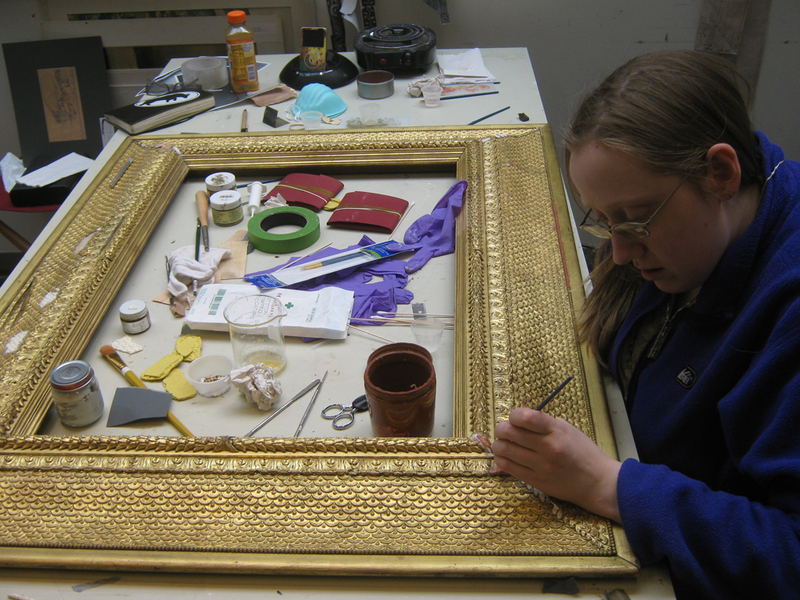 Tatiana Shannon, a post-graduate student at Smith College, Massachusetts, describes the conservation of a frame designed by the Beaux-Arts architect and designer, Stanford White (1853-1906). 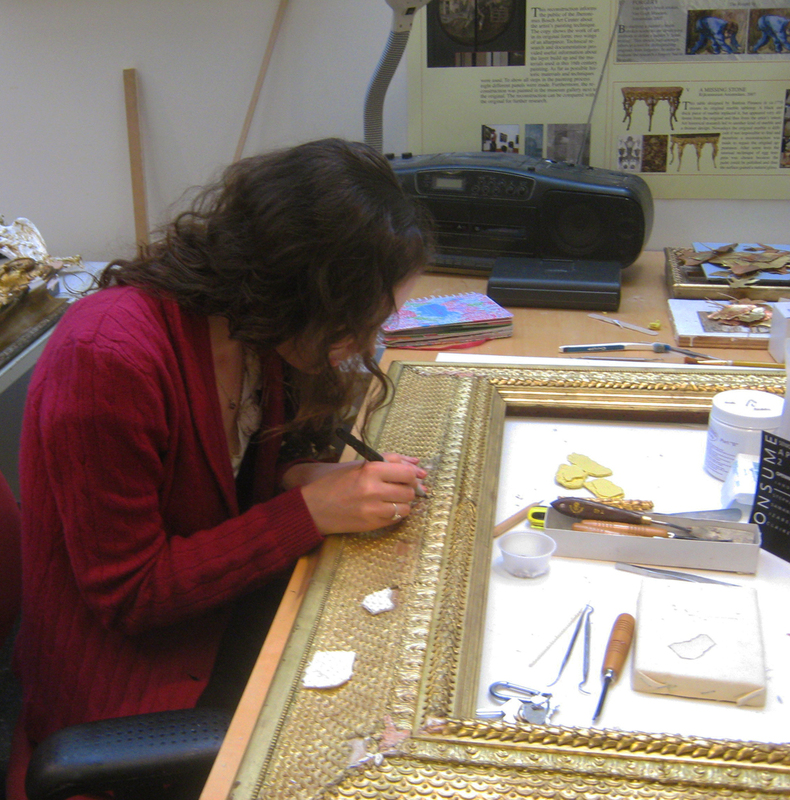 In 2003 William Myers, the frame conservator at the Smith College Museum of Art (SCMA), formed the Frame Conservation Program; a volunteer training program for selected undergraduates from the University of Massachusetts (Amherst, Smith College, Mount Holyoke College, Hampshire College, and Amherst College). 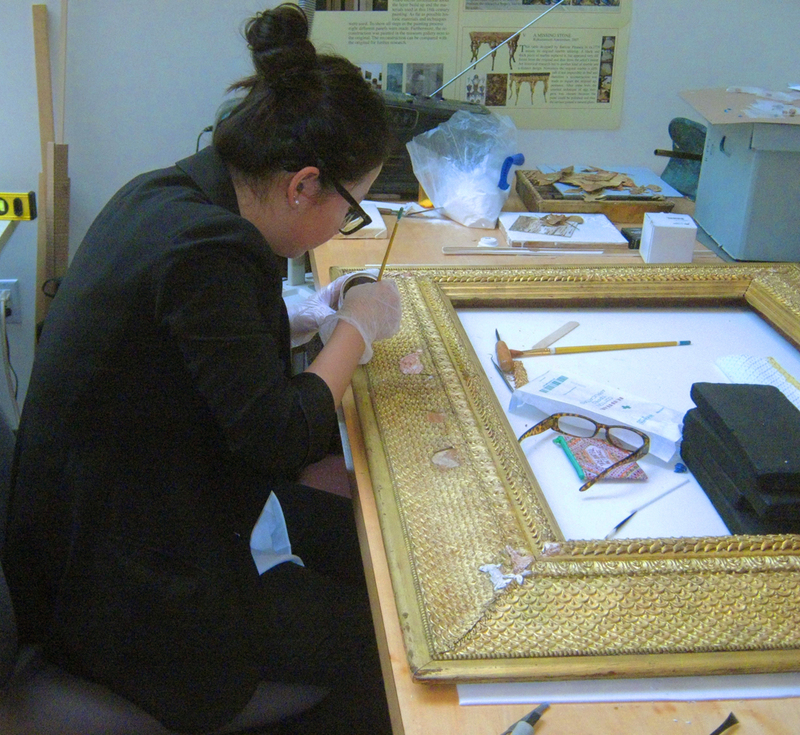 The Frame Conservation Program offers an introduction to conservation theory, and the opportunity to acquire hands-on experience in the conservation and reproduction of historic picture frames, from and for the SCMA’s collection. The training provided by the program has afforded current and former students the opportunity to intern and work at the Metropolitan Museum of Art, the de Young Museum, the Boston Museum of Fine Arts, and LACMA, among other such institutions. Graduates of the program have gone on to win Guggenheim fellowships, and to earn Masters degrees in art conservation from programs across America and Europe. Each fall, the students involved in the program select three or four frames on which they will concentrate their efforts that year, culminating in a public exhibition of their work in the SCMA the following spring. 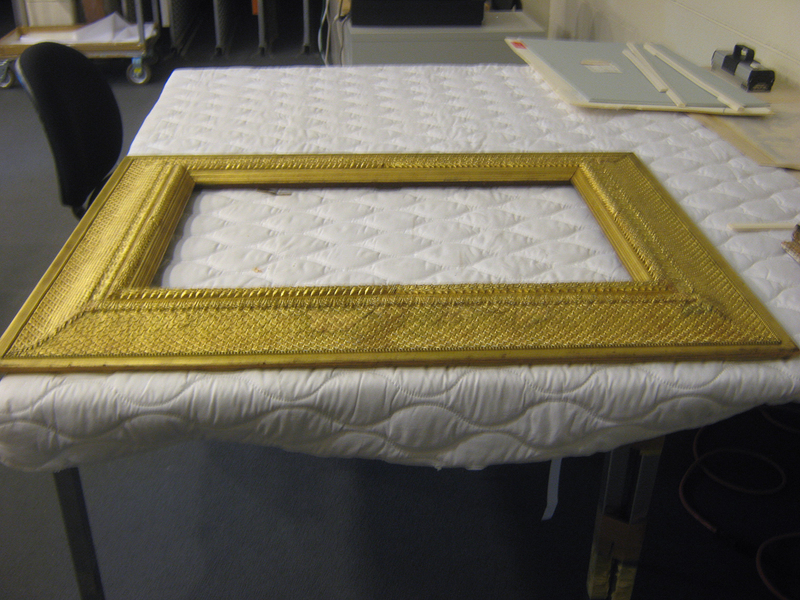 Over the past decade, students of the program have either conserved or reproduced approximately 50 European and American frames from the SCMA’s collection. As a member of the Frame Conservation Program for the last two years, I have had the opportunity to participate in the treatment of a number of historically significant and impeccably designed frames, the chief of which was a lovely and long-neglected early Stanford White frame which came to our attention last year. After consulting with the SCMA’s curatorial department and our American Frame Survey, my fellow students and I decided upon this frame as one of our chief projects for the 2013-2014 school year. One of only four Stanford White frames in the SCMA’s collection, this particular example had high priority for treatment, given the historic and aesthetic value of such a designer’s work. We could see from the museum’s records that it had not been on display in the Smith College Museum of Art for over two decades. Selecting this frame as one of the chief projects for the 2013-2014 year was only the first step in a complex and cautiously-undertaken process. If the Frame Conservation Program was to stabilize and conserve it, so that it could once again be put on display in the museum, we also needed to find a painting which would suit it: not only in its dimensions, but aesthetically and historically as well. Whilst White would, as his designs became increasingly popular, authorize the reproduction and sale of certain patterns through the frame manufacturing company Newcomb Macklin, he was never a commercial frame designer. He made relatively little money on his elegant and innovative designs, as the majority of his frames were gifts for, or collaborations with, his artist friends. He made notable efforts to design frames that perfectly complemented the paintings or sculptures they enclosed, as well as the personality and interests of his friends, and as such tended to use and re-use particular profiles and specific types of ornament for the work of specific artists. When we examined the Stanford White frame we were to conserve, we noted several stylistic and design markers in common with frames for the paintings of the American tonalist painter Dwight Tryon (1849-1925). The reverse ogee profile sloping away from the picture surface, covered overall with an imbricated scale (or feather) pattern, bordered by a bay-leaf torus at the sight and a simple row of beading at the top edge, is consistent with a number of settings White designed for Tryon over the years. 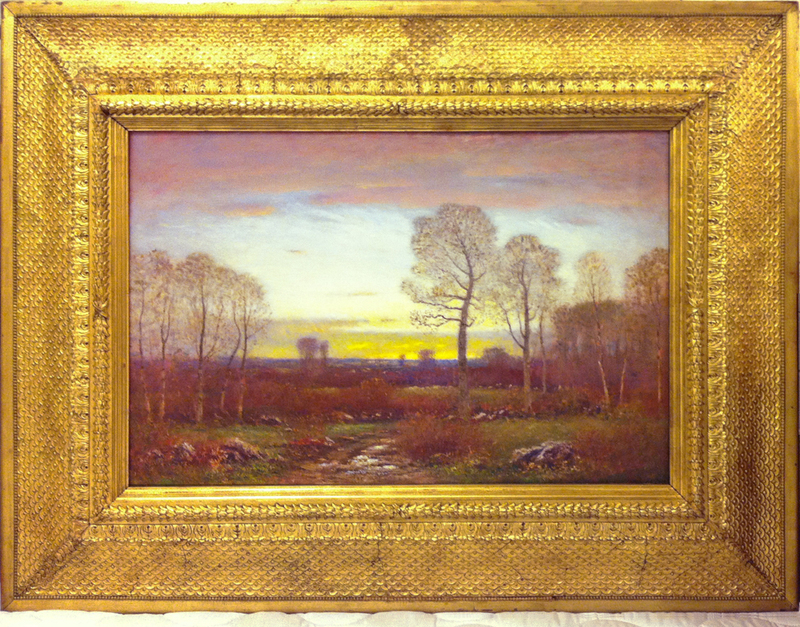 [iii] The frame in the SCMA’s collection is a close match to others produced for his numerous tonalist landscapes, and indeed the quiet, formal idiom of such frames is well suited to their peaceful and contemplative moods (for example, Dawn – early spring, 1894, Metropolitan Museum of Art). Dwight Tryon was professor of art at Smith College from 1886 to 1923, and he left a number of his paintings to the college’s museum. So – with the help of the museum’s registrar, Louise Laplante – it was a relatively simple affair to find one of his paintings in the SCMA’s collection which both fitted our Stanford White frame and harmonized well with the gilded finish. November Evening, one of Tryon’s last paintings before his death in 1925, was the best match, both meeting all criteria and lacking a suitable frame of its own. Having found a suitable painting to complement the frame, the students of the conservation program began their investigation of its manufacture and material history, so as to approach its conservation with an accurate understanding of its construction and current condition. A visual examination of the frame revealed several problems which would need to be addressed to restore it fully. Fluctuations in temperature and humidity had, over the course of a century, caused considerable damage to the applied composition ornament (compo), resulting in radiating fissures and shrinkage cracks over the surface of the frame, as well as several significant areas of loss which had destabilized large sections of the cove. 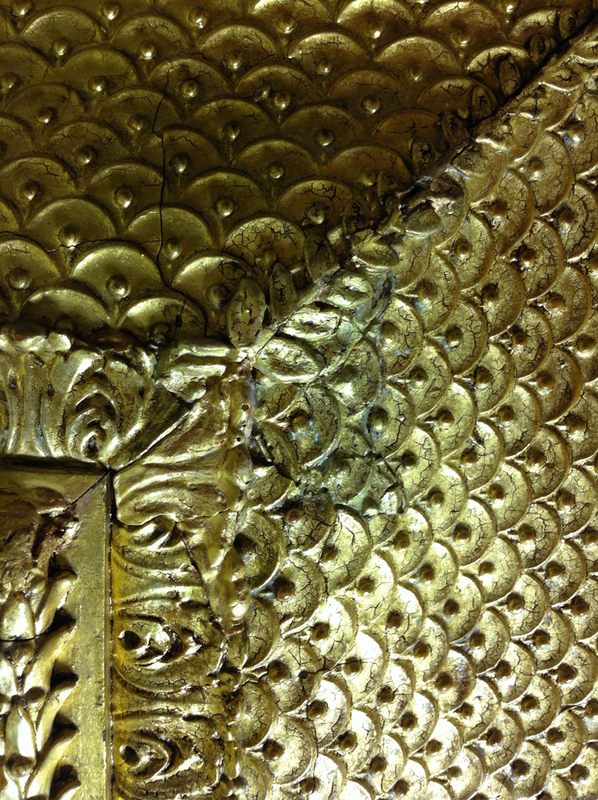 A past attempt to correct this damage had resulted in clumsily-cast fills, coated with a layer of oxidized bronze powder over interference gold which contrasted strongly with the original ornament and gold leaf. Respect for the history and evidence of past treatments to a piece of art is an important consideration when it undergoes further conservation; but in this case, the fills had been executed so poorly that they represented a significant distraction from the aesthetic impact of the frame. They also posed a major challenge to our aim of stabilizing the original ornament, due to the poor fit of the cellulose-based filler and its lack of malleability. Our treatment of the frame was defined by three key concerns. 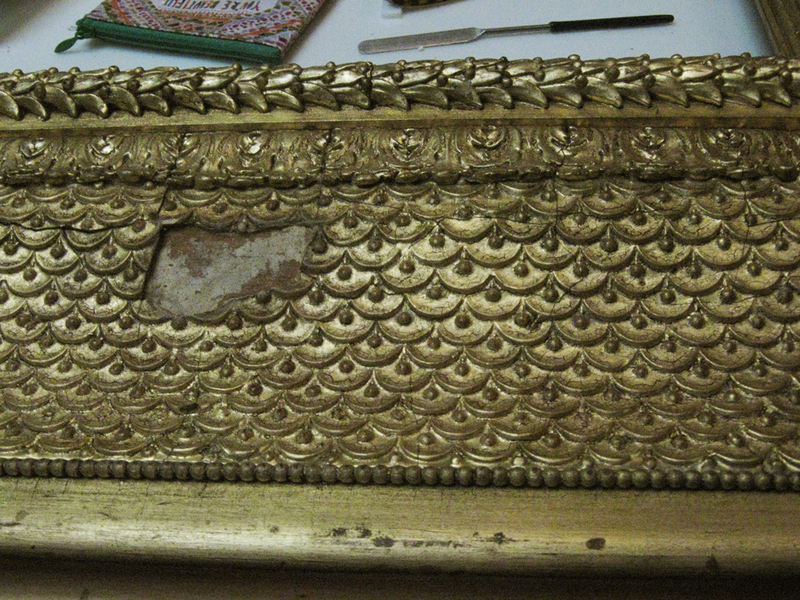 First, we needed to stabilize the original composition ornament without damaging either its integrity, or that of the gold leaf. Secondly, we needed to to excise the previously executed fills without doing further damage to the extremely fragile ornament on the cove. Finally, we needed to find a filler which would allow us to replicate the existing compo ornament with such precision that the existing areas of loss would be indistinguishable to the naked eye from the orginal ornament. While the reverse ogee profile of the frame was one which White returned to many times in the course of his career, its constructon was still very much in question. During the 2013 fall semester we communicated with frame historians and conservators, read every available article that mentioned Stanford White’s work as a frame designer, and conducted numerous examinations of the frame using a number of different tools. By simply tapping gently on the expanse of scale or feather ornament, we were able to determine that the frame itself was hollow; but we did not know whether the compo was laid over wire mesh, paper backing or a wooden chassis. It was critical that we should determine precisely how the compo shell was supported, so as to draft an effective treatment plan – since unless we knew exactly how it was suspended above the wooden armature of the frame, there was no way of knowing whether or not it was safe to remove the previous fills on the cove. In our efforts to uncover more information about its construction, we first examined the frame under a USB microscope at 200 X magnification. The microscope allowed us to capture invaluable high-resolution images instantaneously, and to use minute manual adjustments of the field of view, focus, and resolution to conduct a comprehensive assessment of the surface. During this examination, we discovered a number of randomly-placed nailheads which appeared to have been hammered into the original ornament on the cove. This made it likely that the compo was nailed to a form of wooden chassis extending under either part of the cove or its entirety. To determine how far this chassis extended, we needed a non-invasive method of examination which would allow for an unimpeded view. Through the Smith College alumnae network we contacted Dr. Elizabeth Gatti of Valley Veterinary Hospital, Hadley, MA, who offered us the use of the hospital’s X-ray machine. 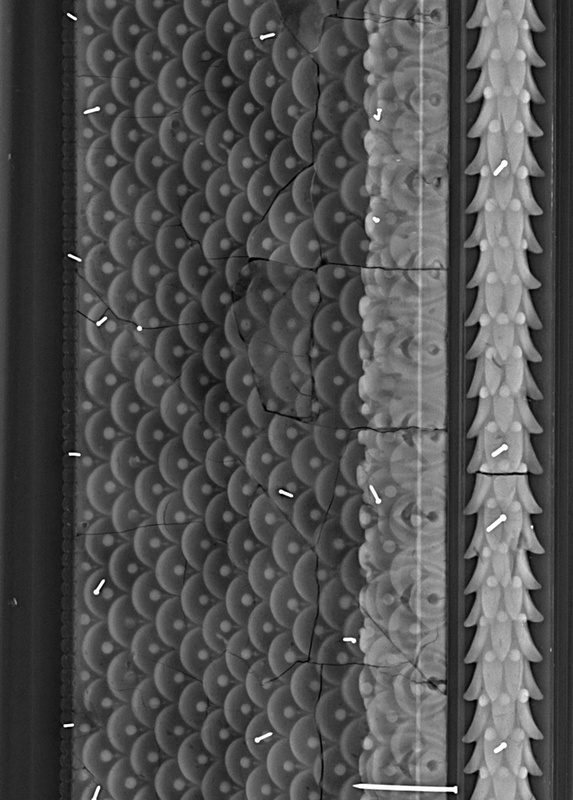 A lateral X-ray of the frame revealed an unidentified continuous mid-gray band of material, probably wood, situated underneath the moulded compo on the cove and the top edge. Now we knew that there was a stable and continuous support to the ornamental shell, the next step was to determine how we could coax the compo to lie flat against the chassis. Compo holds several key advantages over plaster and wood as a frame-making material. It is a thermoplastic substance which, when properly cooled, hardens to a stone-like solidity – but which can easily be returned to a pliable state if exposed to heat. When compo is applied to a wooden substrate, this pliability allows framemakers to stretch or compress it to fit a design without fear of damaging the detail. The chief downside of compo, however, is its reaction to repeated fluctuations in humidity and temperature. Due to the moisture-sensitive nature of rabbitskin glue, one of its key ingredients, compo expands and contracts in sympathy with changes in the atmosphere; and over time will often begin to separate from the wooden substrate to which it has been fastened, as the wood expands and contracts at a different rate from the compo [v]. In the case of the Stanford White frame, the problem was compounded by the nails Cabus had used to keep the hardening ornament from shifting after it was set in place. The compo moved, pressing against the nails and adding to the network of fissures. 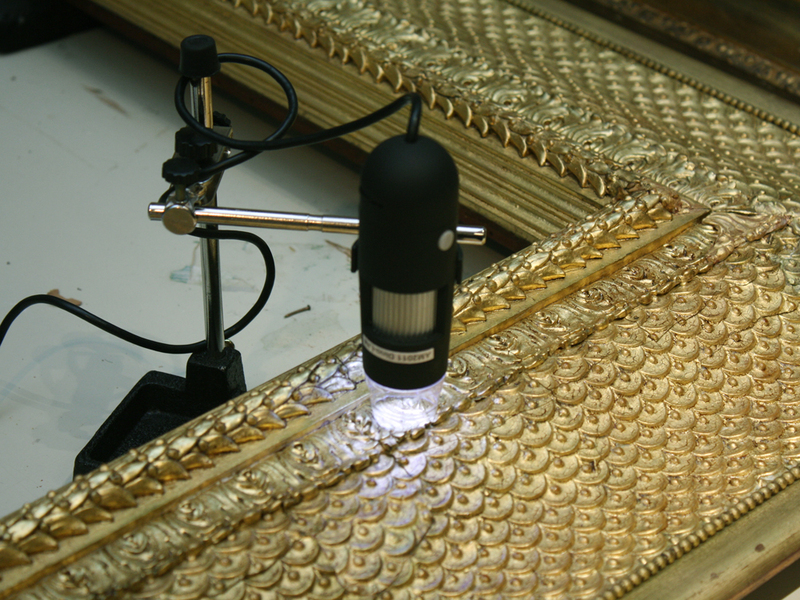 We first needed to heat the compo gently, allowing it to relax just enough so that we could press the cove back down onto the wooden chassis underneath without damaging either the fine detail of the ornament or the gilding. Several methods were tested on sample sections of the frame – for example, using a hand-held steamer, which proved too uncontrollable, whilst using a heat gun on its own was ineffective. In the end, in order to heat the compo ornament without damaging the original gold leaf, a warm mixture of rabbbitskin glue was wicked behind the areas of loss and blind cleavage on the cove. 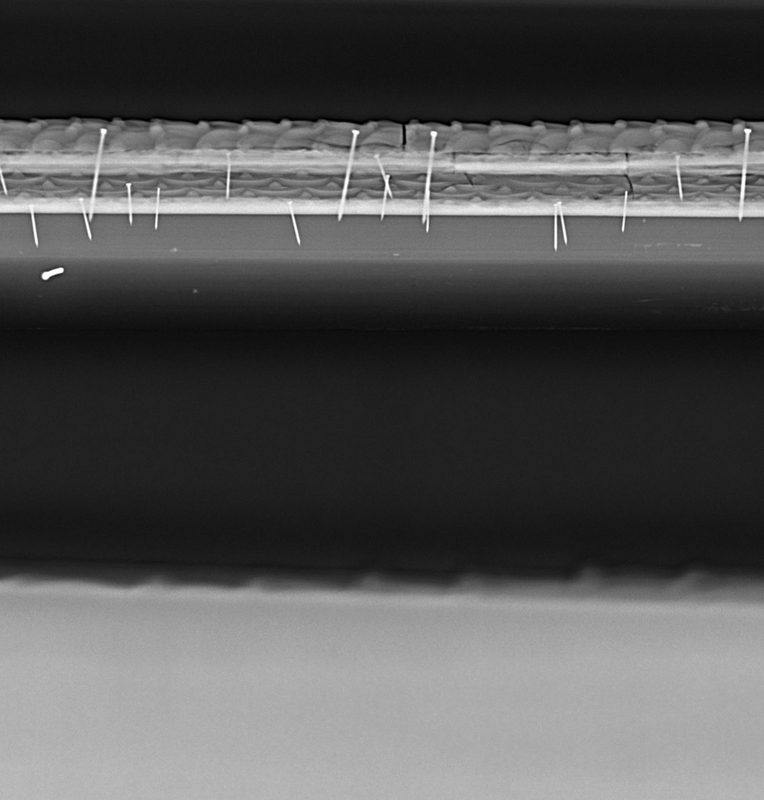 Then the heat gun was held over an envelope of silicone mylar, which was pressed over small sections of the cove. The warmth of the heat gun reactivated the rabbitskin glue, releasing steam into the silicone mylar envelope and rendering the compo ornament pliable enough to be pressed gently back onto the wooden chassis beneath. Having stabilized the original compo ornament, we needed to find a filler which would allow the fine detail of the decoration to be replicated; we also needed to remove the poorly-executed fills on the cove. 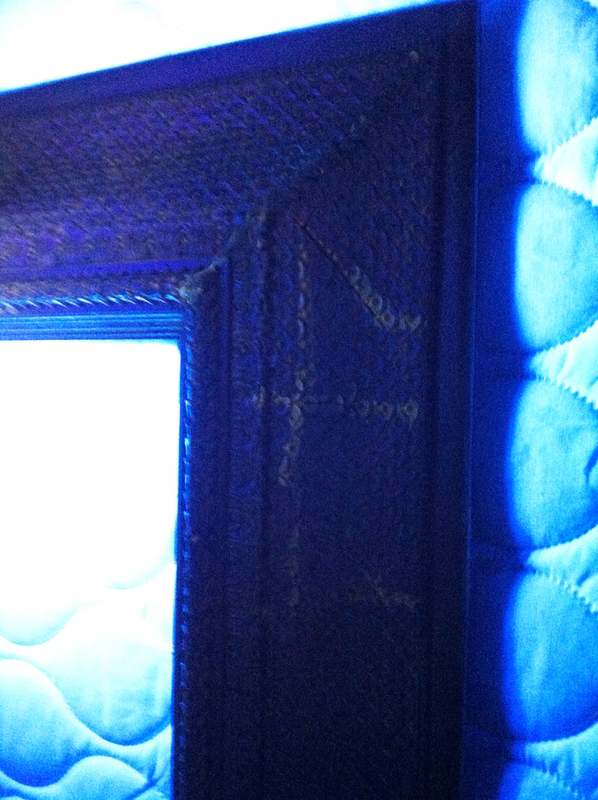 When the frame was examined under ultraviolet light, we were quickly able to pinpoint these previous attempts at conservation. Through a series of solubility tests we determined that the fills were comprised of a cellulose-based, acrylic-bound filler. We used acetone to soften this mixture, and the remainder of the fills were removed with the careful use of micro-scalpels. The wooden chassis underneath was revealed to be in remarkably good condition, with much of the original gesso layer still intact. The only exceptions to the removal of the previous fills were the bands of foliate ornament laid diagonally above the mitres of the frame. 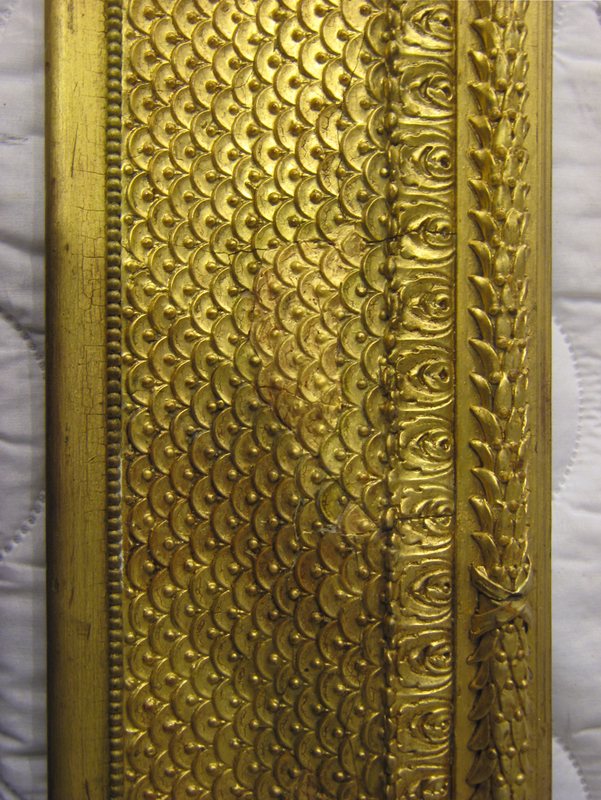 As there were no original examples of these left, we stripped the interference gold from the ornament and left the cellulose fills in place, refining the leaves with wood-carving tools. We then created a dam – made of foam core and silicone mylar – around an undamaged section of the cove, poured on a two-part, liquid silicone rubber mould-making material, and let it solidify. The silicone rubber mould was able to catch a finely-detailed impression of the scale ornament, into which we poured a dual-phase thermoplastic urethane component – colloquially known as liquid plastic. Liquid plastic has been used as a filler material in the lab for the past eight years, so there is a considerable amount of information as to its unique properties. It is a stable material, with some degree of malleability when exposed to heat, and it is significantly less brittle than many other filler materials. This last quality meant that we were able to shave the fills quite thin (less than 3 mm thick), so that they would lie flush with the original ornament, and there would be no concern as to their snapping in half. Once the new fills had been adhered to the wooden chassis underneath, they were were painted with red bole, which was then gently sanded and smoothed out. To match the tone of the original gold leaf on the frame a combination of interference gold, golden acrylics and 23 ¾ carat gold powders were applied to the new fills. With these final steps, the frame was ready for exhibition. 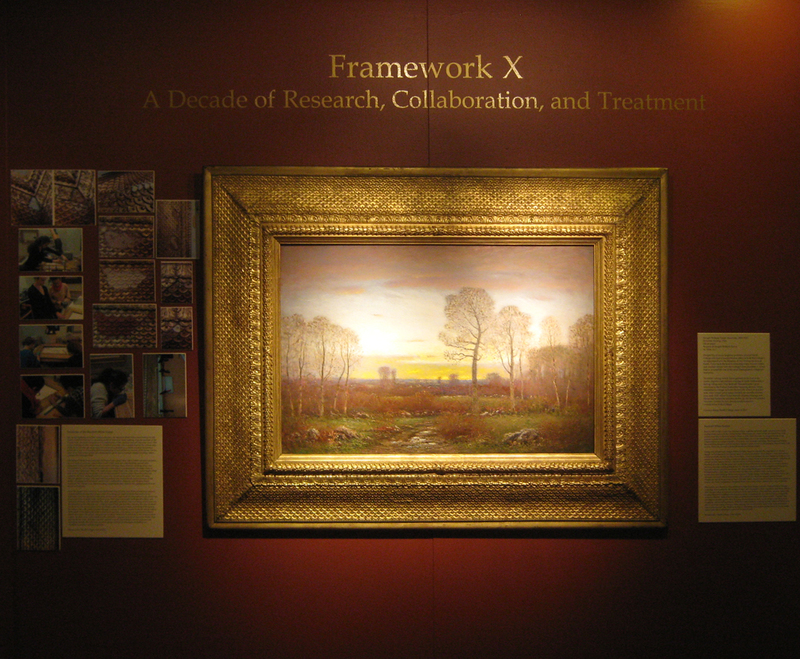 When the painting, November Evening, had been fixed inside the restored Stanford White frame, the whole work was now ready to hang as part of Framework X: A Decade of Research, Collaboration, and Research, May 9th-25th, 2014. Frameworks X showcased the exacting, professionally-executed work of the students involved in the 10th year of this innovative program, as well as paying homage to the achievements of students in past years. Alongside November Evening, our exhibition highlighted two exciting historical replica frame projects; George W. Bellow’s Pennsylvania Excavation (1907) in an elegant reeded moulding, and a hand-carved frame inspired by Newcomb Macklin designs for William Closson’s Fighting Peacocks (c. 1886–98). Whilst the show itself was a brief one, the efforts of the Frame Conservation Program have ensured that November Evening and its accompanying frame will keep their place in the SCMA’s permanent collection. [i] Nina Gray, “Within Gilded Borders: The Frames of Stanford White” in The Gilded Edge: The Art of the Frame, ed. Eli Wilner (San Francisco: Chronicle Books, 2000), 83. [ii] A. Saarinen, unpublished manuscript on Stanford White, n.d., Archives of American Art; microfilm reel 2073, frame no. 352. Quoted in Tracy Gill, Beaux Arts & Crafts: Masterpieces of American Frame Design 1890-1920 (New York: Gill & Lagodich Fine Period Frames, 2011), 22. [iv] Nina Gray and Suzanne Smeaton “Within Gilded Borders: The Frames of Stanford White” American Art 7, no. 2 (1993): 34. With thanks from The Frame Blog to Smith College for the use of their images. NOTE: The scale or feather pattern used by Stanford White in this frame, together with the foliate motif above the mitres, is very similar indeed to the imbricated feather ornament found in Renaissance pastiglia frames; see National Gallery, London: a Venetian pastiglia frame . 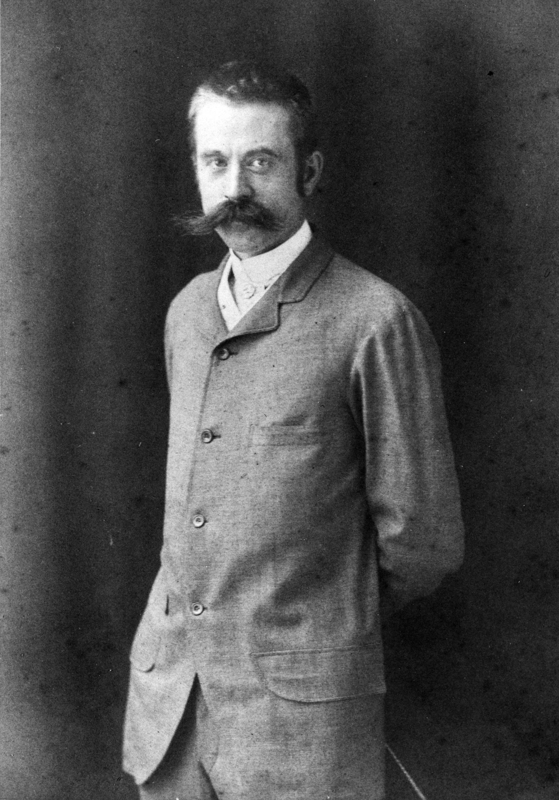 White had lived in Europe for 18 months before returning to set up his architectural practice in New York with Charles McKim and William Mead, and he would almost certainly have brought back sketchbooks full of the buildings, architectural details and motifs which fed his subsequent designs. Can you provide any info on Joseph Cabus and his son? Wonderful project and great results. Thank you! If you would like to email me (lynnrobertsart at hotmail dot com), I can put you in touch with someone who would be able to help you. I’ve contacted the author (who would be pleased to communicate further by email, if you like). This is the formula they use – which was apparently obtained from George Jackson in London! With all due respect, 100 mg of rosin equals 0.1 g.
This can’t be right, obviously a transcription error ? It should read something like 100 g of rosin. 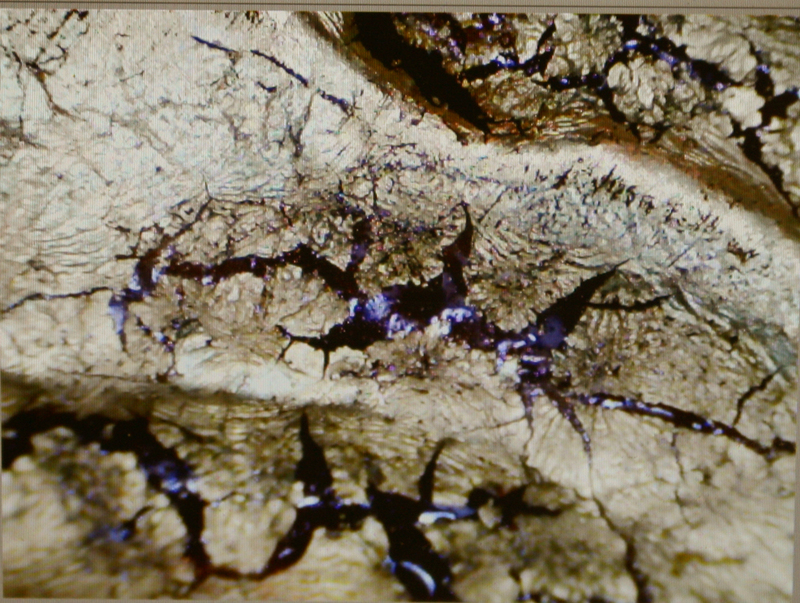 And I believe the turpentine is also an error, it should read Venice turpentine, which is a tree resin, not a solvent ! I’m so sorry to have taken so long to answer your point; I shall put it to the author, but am sure that you are right… I shall correct it when I hear from her. Thank you for alerting me. Yes – the author confirms that you are absolutely right; the recipe should read ‘100 grammes of rosin, and 20 ml of Venice turpentine’. My apologies for misleading anybody. I just had to come back and review this article again. It’s such a fine article and project, indeed. I’ll just be very American and say it’s WAY COOL! Those detail photographs and x-rays are brilliant. Way to go! WOOHOO! I’m so glad that you enjoyed it! The X-rays shed a fascinating light on the construction of the frame, and are so beautifully clear compared with – say – many investigative images of paintings. Thank you for being so enthusiastic!